My home is restored to its normal state, or mostly so, after the weekend sale. We remove the furniture (and some of the books lining the walls, not not all anymore- that got just plain crazy) from the living room/library, bring in shelves, and fill it with pottery. The furniture is back in place, the shelves are stored, and the pottery is waiting to be packed up, delivered to local shops, listed online, etc. I am pleased with my sale attendance- I didn't expect high turnout in July because it's hot and sticky, but I am really tickled by the number of people who came out. Even more tickled by the new people I met! Some funny events: the thermostat batteries died. I felt like it was getting hotter and hotter- indeed, the thermostat read 83 degrees. Even warmer because there were 20+ people in my living room. At the same time, 4 children under the age of 10 decided to play boy-on-girl mortal combat in the back yard and, yes, in the house, complete with screaming, crying, stick-throwing. I am ever grateful to my neighbor friends for corralling our collective children and leading them out of the house. All in a day's work! The surprise hit of the evening was the blueberry lemonade I made for the sale - it was so simple. I made lemonade in a large beverage dispenser and used frozen blueberries (which I'd picked intending to make jam, but running out of steam, stashed in the freezer) instead of ice. It turned a lovely pink color delicately flavored with blueberries. I also made sangria with white wine (a box of Big House White was perfect for this), peaches, lemon verbena, some lemon/ginger infused vodka, and seltzer. Both were Yummy. We're still enjoying the last of the beverages, as well as the tuberose I bought for the taller vases. I'm taking this week off for some quiet time and rejuvenation. I hope you have a good week! I just pulled this little bitty pot (it's about 1.5" tall, mouth about as big as a quarter) out of the little kiln. I made it to test using the honeycomb foundation pieces on thrown work. I can barely even stand it I love it so much. I'm in the middle of loading the big kiln with the last glaze load. Mercy, it is HOT outside. I'll wait until sunset to begin firing. How's your week treating you? I feel like it is Thursday rather than Wednesday. But my heavy work is almost finished, and I'll be glad to spend time organizing, setting up, and pricing tomorrow and Friday. You've seen this image before. I'm not sure if I got lazy or if I just really like it, but it's the postcard. Those are going out today. I also sent an email version. If you're local and would like a print or email postcard, send me an email and I'll get one out to you. Last night I fired my last bisque load. Today I'm doing a small touch-up glaze firing, then I'll be glazing all day tomorrow, firing tomorrow night, and unloading it on Thursday. Lots of setting up and spiffing up to do around here to get ready to open the doors for y'all. I might be back later this week with some sneak peeks. Like this one. Have a nice week! Stay cool- it's scorching hot here in Memphis! I'm woefully behind on getting out postcards for this event, but given the fact that this is 1 of 4 in the next month, I don't feel too too terrible. So. If you're in Memphis, please come on over on Friday and Saturday (5:30-9 Friday, 10:30-4 Saturday) to see the pottery. There's slightly less than I've had than in years past, but again, this is sale 1 of 4. Okay. Time to finish glazing. This weekend my market sales were sluggish enough that I realized I still have enough inventory to have a home sale without killing myself making new work. SO! Friday, June 4 after work/early evening and Saturday June 5 10:30-5:30 I'm opening up for my semi-annual move-the-living-room-furniture home sale. 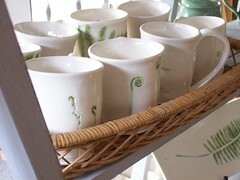 Berry bowls, mugs, platters, egg vases, serving pieces, herb markers, honey pots- I'll have it. More details on my Bridgman Pottery Facebook page as the date nears. Have a great week, y'all. I've got work to do! botanical mugs and platters catching the morning light in my living room. Yesterday little boy proclaimed "our whole house is a pottery store!" Several things, including one of my favorite small platters and half of the tiny vases, went last night. Thanks to everyone who turned out in the heat and humidity. I enjoyed meeting new people and seeing old friends. Come cool off with some lemonaid! I got up really early this morning to get my eggs from the farmers market downtown and came away with quite a haul. My favorite farmers (I just signed up for their CSA for the fall last week!) told me that if I'll keep my chard cut, I may be able to squeeze another month out of them. YAY! Isn't this the prettiest? I unloaded the kiln this morning- here's a peek at what I have to offer. This is the first time in more than 3 years that I've done my sale by myself. Usually my friend Katherine of Turtle Pottery joins with me, and at the pre-holiday sale I always have an artist of a different media join in. This summer, it's all me, so it will be less of a shindig than usual. I'll have light refreshments on Saturday and a bit of wine on Friday, so stop by if you're in the greater Memphis area. If you're a long-distance blog reader, I'll have a big etsy update next week. If you've pre-ordered berry bowls from me, about ten are still upstairs and will be glazed next week. I'll be making them through the end of summer. Annual summer sale! teapots, cake plates, mugs, teacups, platters, bowls, honeypots, berry bowls, bird houses, sea urchins, tiny bowls, ladybug ware, pitchers and creamers, sugar bowls, cannisters, herb markers, a very few super-on sale seconds. Lots and lots of pottery. Friday, 6-8. Saturday, 11-4:30.Scroll down for a map! today's task- finish addressing and mail the postcards for next weekend's sale. 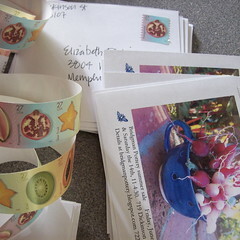 My postcard mailing list is limited to Memphis and surrounding suburbs, so I only send them out a week ahead of time. I'm pleased with how they turned out, but I am definitely going to go the sticker-address-label route next time. I LOVE the tropical fruit stamps, but I've always been a fan of postage stamps. Two years ago (or was it only last year?) I bought 200 Gee's Bend quilt stamps. I'm still using them, just adding more penny stamps. Stamps are such little works of art- I frequently find myself peeling canceled stamps off envelopes to keep for craft projects. When Gary and I married in 2000 the Louise Nevelson stamps had just come out- all black and white and spare and graphic. I used them on my wedding invitations! I know some people must have thought we were insane, but Nevelson has been one of my favorite artists since I was in high school. I even came up with a Nevelson-inspired project when I taught kids' art camps. Now if only there would be Louise Bourgeois spider stamps. . . . . I'm feeling a little all over the place today, seeking balance and realizing that I always feel this way the week before a sale. Just keep breathing, I tell myself. Bridgman Pottery annual studio sale: Friday, June 13, Saturday June 14. Father's Day weekend. Usually I have another potter with me, but she is in Spain right now, then heading on to Australia for a 6-week research trip, so it's solo mio this time. If you're local and need directions, email me! In the next few days I'm going to be putting some of my old work up on etsy. It's going to be cheap, because I am tired of looking at it, in its sad dusty pile, over in the corner of my studio. There's nothing wrong with any of it, but it is no longer a reflection of my style- a little rustic for my current tastes. There may be 6 pieces in a variety of colors, all functional, all leafy, all from 2001-2005. I stopped doing these right after Katrina because they just didn't make me happy anymore. This piece pictured above won't be included, I have no idea what happened to it, it's just the only photo I have of them, and it's blurry because it was a digital photo of a slide. So after I re-shoot the photos and put them up, I'll let ya'll know. Their original prices were in the mid 40s- these will be in the low teens to single digits. If they don't sell, off to goodwill they go.